Dr. Babitha completed her MBBS from Academy of Medical Sciences from Kannur, Kerala and obtained MD (Pathology) from Government Medical College, Kottayam, India. She has also completed DNB (Pathology) from National Board, India. 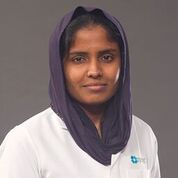 Dr. Babitha started her career as Senior Resident Pathologist in Government Medical College, Kottayam and became Assistant Professor of Pathology in MES Medical College Hospital, Kerala, India. She has more than 10 publications in peer reviewed journals including two original articles. She has presented many papers and posters in national and international conferences. She has keen interest in Histopathology and Immunopathology. She is honored with membership of National Academy of Medical Sciences, New Delhi, India. Dr. Babitha can speak fluently in English, Malayalam and Hindi.